On Saturday evening, December 28, 2013, four women from Boise, Moscow, and Parma, Idaho, gathered with difficulty and courage in Marsing, Idaho, to protest a 450-ton, 376-foot-long component of new tar sands mining facilities, as it exploited Idahoans’ highways, bridges, and rights on its way to Alberta, Canada. Outnumbered by more than 100 onlookers who seemed mostly supportive of the Omega Morgan-hauled transport of the General Electric subsidiary equipment, they stood in silent, sorrowful vigil, demonstrating their opposition with protest signs reading, for example, “End Big Oil Tyranny” and “Idaho Says No Dirty Energy” [1, 2]. The Monday, December 23, Climate Justice Forum radio program hosted by Wild Idaho Rising Tide (WIRT) features a recorded interview of a Rising Tide climate activist whom police illegally arrested as an innocent bystander at a vehicle lock-down blockade that temporarily halted an Omega Morgan-hauled tar sands megaload in John Day, eastern Oregon, on Monday, December 16. Broadcast on progressive, volunteer, community station KRFP Radio Free Moscow every Monday between 7:30 and 9:30 pm PST live at 90.3 FM and online, the show covers continent-wide dirty energy developments and climate activism news, thanks to the generous, anonymous listener who adopted program host Helen Yost as his KRFP DJ. 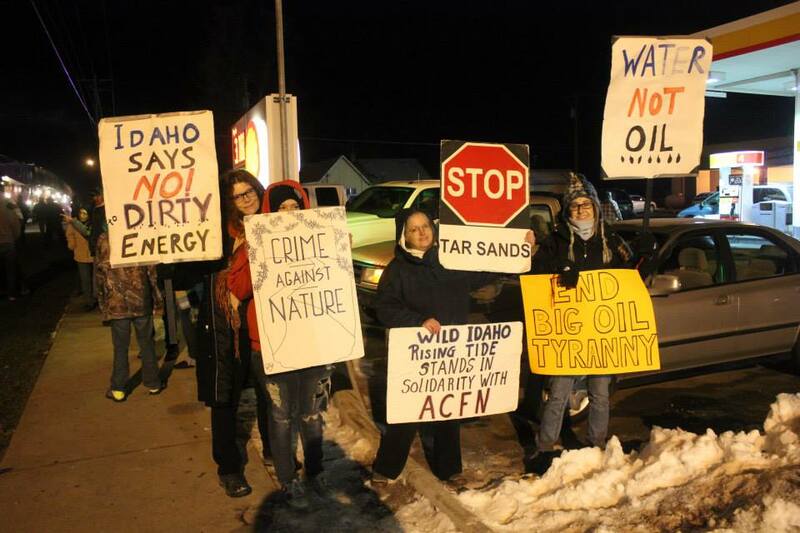 Updates and additions to Idaho & Montana Tar Sands Megaload Protests! Over the last month by Christmas Eve, Umatilla and Warm Springs tribes, Rising Tide groups, and allied organizations and activists have staged dozens of actions escalating Northwest resistance against tar sands mining and megaload exploitation of indigenous and public lands and people. At least five Umatilla-led protection ceremonies in Pendleton, four Port of Umatilla protests and blockades, three Portland and Seattle area office occupations of megaload hauler Omega Morgan and designer Resources Conservation Company International, two blockades in John Day, Hermiston and Stanfield protests, a Portland visit to the Oregon Department of Transportation, and a light brigade overpass action have resulted in nineteen mostly illegal arrests of activists at the four blockades . Activists with 350, All Against The Haul, Blue Skies Campaign, Idaho Residents Against Gas Extraction, Montana Indian Peoples Action, five Rising Tide groups, and multiple indigenous tribes are planning protests in Umatilla, Oregon, Missoula and other locations in Montana, and in or near Marsing, Mountain Home, Bellevue, and Salmon, Idaho, over the next month [2-7]. In the wake of years of relentlessly meeting every Highway 12 and 95 tar sands facilities shipment in Idaho with resistance, Wild Idaho Rising Tide (WIRT) and allies will not stand down, despite recent, illegal, and unethical police attempts in John Day to dissuade further First Amendment-protected expressions of citizen dissent of the state/corporate fossil fuel agenda . As news of Rising Tide and allied protests has spread through some of the most popular Idaho media outlets over the past month, we are calling Oregonians, Idahoans, and Montanans to rise up against tar sands megaloads . THREE 1.6-MILLION-POUND HIGHWAY 95 MEGALOADS? Mammoet, the ExxonMobil/Imperial Oil hauler, has proposed moving the first of three 1.6 million-pound, 472-foot long, 27-foot wide, 16-foot tall megaloads up Highway 95 from Lewiston within a month. These heaviest and longest northern Idaho transports weigh almost twice as much and are 100 feet longer than the Omega Morgan load currently crossing Oregon and that earlier attempted passage through the Nez Perce Reservation until halted by a lawsuit victory. The shipments would spur construction of a custom Interstate 90 on-ramp and close this primary access highway for “brief” night-time periods, as they avoid and travel under I-90 bridges and cross traffic to rejoin the interstate. A private Boise engineering firm that conducted 2011 bridge analyses for the Imperial Oil megaloads contacted Wild Idaho Rising Tide (WIRT) on Wednesday with a stakeholder letter sent to property owners, non-governmental organizations, and agencies. Forsgren Associates assured us that several Spokesman-Review articles erroneously stated the final Alberta tar sands destination of the equipment. Bound for a Calumet refinery in Great Falls, Montana, the megaloads will be used to remove sulfur from diesel and thus later reduce sulfur dioxide and particulate emissions from diesel combustion engines. Are these declarations more green-washing, like Resources Conservation Company International statements about its evaporators? Nonetheless, WIRT opposes all weapons/processors of chemicals of mass destruction supporting expansion of fossil fuel infrastructure, even Montana or North Dakota components of tar sands or shale oil production facilities. We are continuously forging wider climate and tribal activist alliances, to stage protests on inland Northwest roads. All three convoys facilitated by incestuous dirty energy industry/state relationships would traverse and disturb Moscow and the Coeur d’Alene Tribal Reservation. Like dozens of other smaller behemoths, they will cost citizens damage to personal and public rights, lives, property, and infrastructure and ultimately the Earth and its climate. Three megaloads could be traveling through Lewiston and Moscow on their way to a Calumet refinery in Great Falls, Montana. The cargo is expected to arrive at the Port of Wilma just west of Clarkston before taking U.S. Highway 95 and Interstate 90 through Idaho, said Adam Rush, a spokesman for the Idaho Transportation Department at Boise. At 472 feet in length, the shipments will be longer than a football field. They’ll weigh 1.6 million pounds and be 27 feet wide and 16 feet tall. The 15 adult protesters charged in Monday night’s actions to delay the megaload were arraigned on Wednesday morning in Grant County Justice Court. * No contact with Omega Morgan or its employees. * No coming within 1,000 feet of materials, equipment, or other loads being transported by Omega Morgan. * No possession of “dragon sleeves” or other items used to lock oneself to a fixed object or to prevent safe extraction. The accused were charged with misdemeanors in connection with the protests, in which vehicles were disabled in the highway, in an attempt to stop the Omega Morgan megaload from proceeding. A 16-year-old girl, also apprehended at the protests, was released to family friends. The Idaho Transportation Department (ITD) might allow three megaload deliveries of oil field equipment to travel through Moscow, en route to a refinery at Great Falls, Montana. One vehicle and its equipment load would weigh 1.6 million pounds total and be 472 feet long, 27 feet wide, and 16 feet high, according to a press release sent out by ITD. 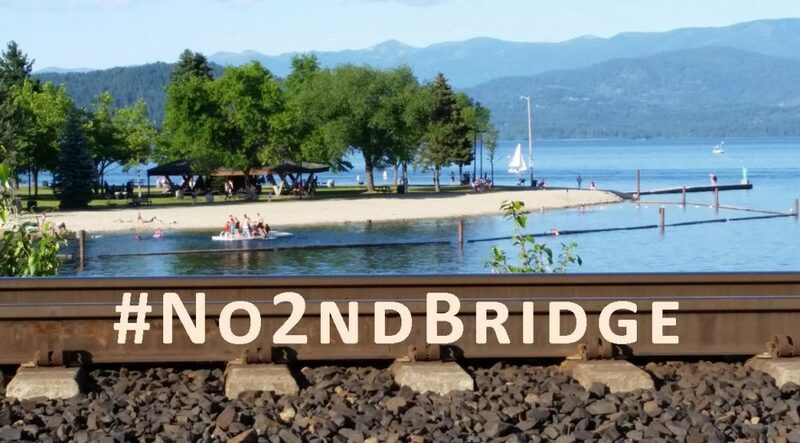 State officials aren’t “being fully transparent” about the route or when the cargo is expected to reach certain areas, because they want to avoid controversy, said Helen Yost, an organizer with Wild Idaho Rising Tide, a group based in Moscow. About a dozen protesters came out to show their displeasure when four smaller megaloads came through Moscow in mid-October, for example.